Many times, clients would like to have an email and an address for folks listed in the In Memory Of part of a donation page. 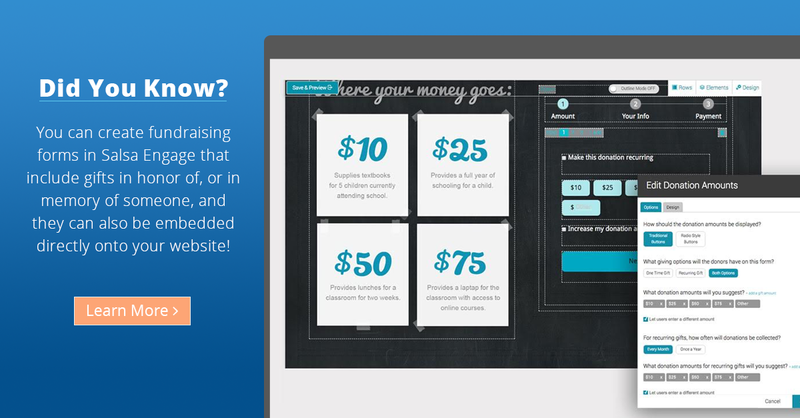 If that would be helpful for your fundraising efforts, then read on! The solution is to store the In Memory Of (IMO) email and and address in donation record fields that Salsa does not use. Salsa purposely left three fields untouched for our clients to make enhancements just like this one. In this case, the fields VARCHAR0 and VARCHAR1 in the donation record will be used to save the IMO email and address. The solution needs to be installed in the templates for donation pages where the IMO email and address need to appear. Here are some steps that you can use to install the solution. Each donation page can have, or not have, the IMO email and address. Here are some steps that you can use to cause the IMO email and address to be used on a donation page. Locate the Pre Submit Footer field. It's right at the bottom of the page. Copy the HTML that follows these steps. Paste the copied text into the Pre Submit Footer field. It should be pasted after everything else that may already be there. The IM email and address will appear in the VARCHAR0 and VARCHAR1 fields when you are viewing a donation. A report that contains the IMO email and address just needs to add VARCHAR0 and VARCHAR1 to the report fields. Be sure to use labels that mention "In Memory Email" and "In Memory Address" so that the report makes sense when it's viewed later!